More than ever, there is an urgent need to rediscover the timeless relevance of traditional wisdom to understand the issues of our day and age, and on that journey one must encounter the age-old philosophy of Judaism. In the 12th century, Yehuda HaLevi authored a classic of world literature when he developed a vibrant dialogue between a Jewish scholar and a ruler from the kingdom of Khazar. The book, published in Arabic, was called The Kuzari, and it addresses a series of theological, philosophical, and ideological concerns posed by the Khazar king. Among the topics discussed: comparing the Jewish, Christian, and Muslim faiths, the history of the world, origins of the Jewish nation; how God interacts with the physical world, Israel and the nations, the concept of Sabbath, the World to Come, faith, prophecy, astrology, proofs for the existence of a soul, the human intellect, free will, and more. 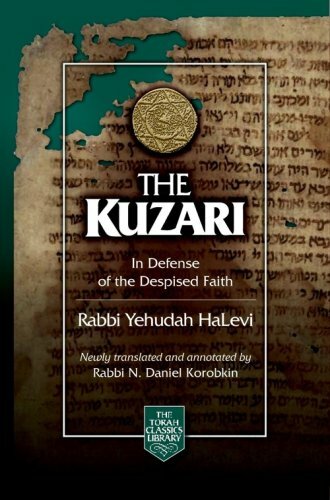 This current edition of The Kuzari offers an accurate, easy-to-read translation of the text along with incisive commentary, an extensive biography of Yehuda HaLevi, and a history of the original Khazar kingdom. The result is a richly-rewarding learning opportunity one that provides a compelling look at timely answers to timeless questions as they relate to the human condition in a modern world. A true product of Spain's Golden Age, Yehuda HaLevi was born in Toledo in the year 1075, and raised in an intellectual climate where he became well-versed in Jewish scholarship, Arabic literature, as well as Greek science and philosophy. He was a physician, prolific poet, philosopher, and communal leader. To defend Judaism against its detractors, he authored The Kuzari, which took 20 years to complete. HaLevi died in the year 1141, but his volumes of poetry and philosophy continue to inspire and inform through eloquent translations and repeated printings of his many enduring and popular works. Rabbi N. Daniel Korobkin received his rabbinic ordination from Ner Israel Rabbinical College. He is the spiritual leader of Kehillat Yavneh in Los Angeles, CA, where he resides with his wife and children. He directs synagogue services for the Orthodox Union on the west coast, and continues to pursue medieval Jewish studies as a doctoral candidate at UCLA. "In this beautifully produced, fluidly translated, clearly annotated edition, we have the easiest entrée to HaLevi's thought." "His beautiful easy-to-read rendition of the classic masterpiece of Rabbi Yehudah HaLevi offers much to both the layman and the scholar."